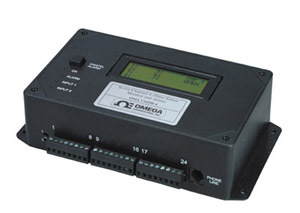 Model OMA-VM500-4 monitors up to seven 4 to 20 mA inputs and dials up to four phone or pager numbers if any 4 to 20 mA input goes out of limits, if the dry contact input is not in its programmed normal state, or if there is a power outage. The integrated voice tells you which input is out of limits. You can call the unit at any time to hear a report on the input and power status. The OMA-VM500-4 is easily programmed over the phone. Simply locate the unit in the area where you want to measure the 4 to 20 mA inputs. Plug in the phone line and the power adaptor, turn the unit on and then call the unit from another phone or cell phone. Follow the spoken instructions and the instructions in the operator’s manual to program the phone numbers where you want the dialer to call in case of an alert condition and the upper and lower limits for the 4 to 20 mA signals. Then hang up by pressing the "0" key on your phone until the unit says "Good-bye." The system is now programmed and is monitoring your facility for 4 to 20 mA input and power status. 참고: OMEGACARE SM extended warranty program is available for models shown on this page. Ask your sales representative for full details when placing an order. OMEGACARE SM covers parts, labor and equivalent loaners. Each unit is supplied with complete user’s manual.